Two phases of Liver Detox - Are You Ready for a Change? Detoxification is an every day, all day, year round process. And as this world becomes more toxic than ever it can seem to be a daunting task to prevent and recover from almost constant exposure to so many forms of pollution in our environment and grocery stores. Environmental impact and health is slowly being recognized by more and more health care providers. There is a substantial amount of evidence related to the physical impact of exposure to toxins on your body. Italian researchers have found physical changes indicating the reduction of your ability to detoxify if you have MCS or problems with environmental exposure, even including exposure to pharmaceuticals. You might experience some of these symptoms, and more, because you are over exposed to toxins: Headache, Coughing, wheezing and shortness of breath, Eye, ear, nose or throat irritation, Chills or Fever, Dizziness or vertigo, Nausea, Hair loss, Skin rash, Infertility of women and men, Liver disease, Neurological dysfunction, such as loss of memory or concentration, or confusion, Weakness or fatigue, Depression, or cancer. Many people are now plagued by multiple chemical sensitivity (MCS). This has been defined as “a chronic, recurrent condition characterized by reduced tolerance to various environmental agents or to a class of chemical substances". MCS America is a good source for help and information about the various forms of this illness. The liver performs two phases of detoxification; Phase One (oxidation) and Phase Two (conjugation). In Phase One, the liver uses oxygen and enzymes to burn toxins. This process is called oxidation, and makes the toxins more soluble in water. Making them more water soluble is necessary so they can be more easily excreted from the body by the kidneys or the liver. Most environmental toxins are fat-soluble to start with, and therefore difficult or impossible to eliminate without the liver’s help. Phase One enzymes oxidize benzene, producing benzene quinones, which are a source of increased toxicity. To complete the detoxification of benzene, your liver relies on Phase Two enzymes. The bottom line on Phase One detoxification is: you need it but you don’t want Phase One activity to exceed the ability of your liver’s Phase Two enzymes to finish the job. Medications can also increase or decrease Phase One liver activity in ways that are highly specific to the drug and its duration of use. Intense scientific research being done around the world is examining how nutrition can not only help facilitate the detoxification process but also be the catalyst. No surprise that these foods are recommended for their health benefits. To rid itself of toxins produced by Phase One detoxification, the liver performs a second phase, called conjugation. In this phase, oxidized chemicals are combined with sulfur, specific amino acids, or organic acids, and then excreted in bile. This phase of liver detoxification is inhibited by nutritional deficiency, toxic exposures, and medications such as acetaminophen (brand name Tylenol), alcohol consumption, and low protein intake that deplete glutathione which is needed for acetaminophen detoxification. The most important amino acids for Phase Two detoxification are cysteine and methionine. These two amino acids are the main dietary sources of sulfur, which are found in nuts, seeds and beans. The usual adult RDA of cysteine and methionine is 700 to 1000 mg. per day, but is never fixed, because it fluctuates with the liver’s burden of toxic compounds. The body’s stores of these amino acids are depleted in the process of detoxification, so the greater the toxic stress, the more the body demands. Bioflavonoids may also be beneficial for stimulating Phase Two enzymes in Detoxification. Bioflavonoids are abundant in fruit, vegetables and green tea, and are the active ingredient in many herbs. Research indicates that bioflavonoids can facilitate the detoxification process. Scientists from the University of Seville in Spain note that the bioflavonoid luteolin has antioxidant, anti-inflammatory and antimicrobial activities and may help detoxification. Luteolin is found in vegetables such as peppers, celery, carrots, in herbs such as rosemary, thyme, oregano and peppermint. A prime example is milk thistle, an herbal (folk) remedy for the liver. The active ingredients are a group of bioflavonoids collectively called silymarin. Research indicates that milk thistle may offer protection from liver disease. The standard amount of silymarin taken is 70 to 210 mg. three times a day. Water Kefir is a huge detoxifier of the liver (recommend this above all else). It is capable of erasing decades of alcoholism. 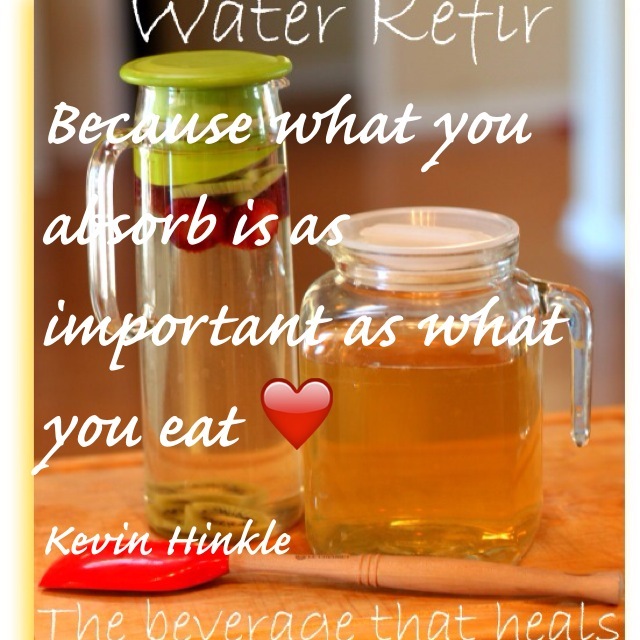 Water Kefir also aids the body in absorption of all nutrients. It the best natural remedy for allergies as well as the best natural antibiotic. This is a powerhouse.